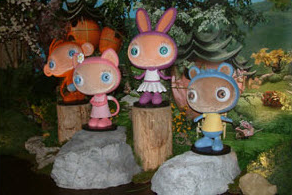 "We’re delighted with the individual static props of our Waybuloo Pipling characters. The attention to detail, high-quality finish and sensitivity to the brand is outstanding!" Although making mascots is our speciality, Rainbow Productions also has experience in creating a wide range of custom-made puppets and props to suit your production needs. We also build and adapt costumes to be as sympathetic as possible to their environment. 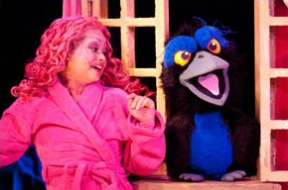 For example, costumes are adapted for use on stage in theatre productions. Our production team can also apply techniques and use fabrics that enable mascots to be better equipped for use in environments such as marathon running and some extreme sports. Discover more about our broad range of bespoke puppets, props and uniquely adapted costumes. We’ve worked with clients to develop puppets for use in theatre productions as well as for use in classrooms to help convey educational messages to children. 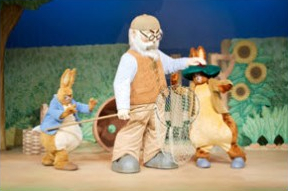 It is also possible to fit some props and promotional costumes with animatronics software which has been developed in-house to give added movement in a live environment. Our production team’s specialist skills have been used to adapt costume characters for world record attempts. We’ve also created stunt costumes worn on helicopter rides and zip-wires. Increasingly, we’re working with organisations such as charities to develop promotional character costumes as eye-catching ways to enhance fundraising campaigns. 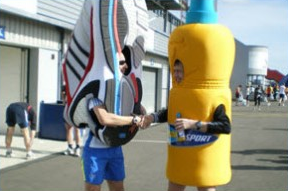 Many projects also involve costume characters being specifically adapted for the wearer’s comfort during participation in marathons and other extreme activities. Rainbow Productions also works with children’s entertainment brands and show producers to manufacture costume characters for use in touring live stage shows. These costumes are adapted to take account of the specific needs of the production as well as the studio and stage lighting environment.